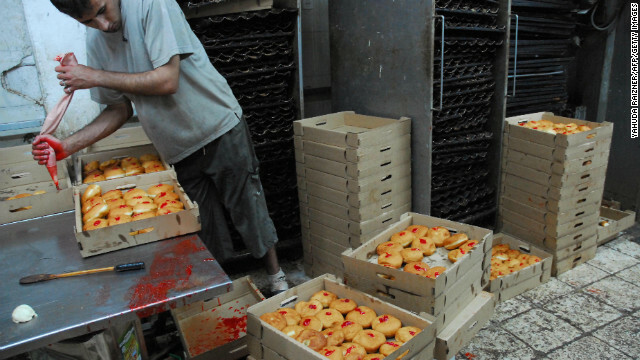 So popular are the doughnuts in Israel that Jewish-American chef Joan Nathan recalls the local marketplaces resembling a "pastry auction" around this time of year. (CNN) - It is no accident that Hanukkah comes in the darkest time of year. The winter holidays are about light, about miracles, and about waking up to light when it is least visible to the naked eye. Food-wise, we jolt our senses alive through texture, taste and flavor with fried foods that couple warmth, crispness, and the smoothness of oil in order to reinvigorate and fine-tune us just as the sun begins to seemingly disappear altogether. For some, Hanukkah is "the potato pancake holiday" - a holiday that takes the mundane potato and gives it a massive makeover. It is shredded and tossed and recombined, squeezed and remolded into new form and then fried up lightly so that its texture shifts, its flavor alters. The latke (pancake) itself becomes the miracle of light, of oil, and of transformation. Oil makes everything taste better...too bad our lifestyles have made it less welcome. Live for 60-80 years not enjoying oil, or live for 40-50 enjoying it every day. How many Groundhog Days without oil do we really need to see anyway? I just told myself olive oil's good for me and cook everything in it. Only I don't know about doughnuts in olive oil? Sounds iffy. If you want a great potato pancake, go to Perkins !! We don't have those in California. I am not a pancake person anyway. My perfect breakfast is Carnitas with two over easy eggs, pinto beans, warm flour tortillas and fresh hot salsa.